Coasters are one of the easiest items to start with when learning to knit. They take little time, yarn, or knowledge to make. All you need to get started are a few supplies and patience. Kick off autumn with a set of candy corn inspired knitted coasters! This pattern is an easy project for beginners. While it looks difficult to do the stripes, this pattern uses one skein of yarn that is dyed to make stripes. 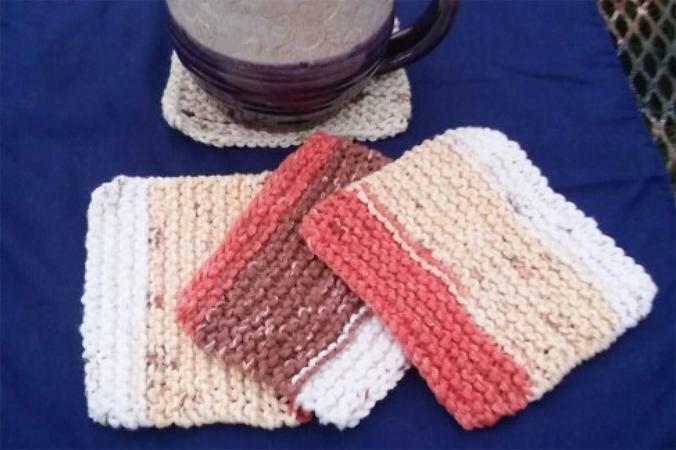 To make the coasters shown in the pattern, you will need to use Lily Sugar and Cream yarn in Natural Stripes, which can be found in most craft stores for less than $5. This pattern uses one basic stitch - the knit or garter stitch. After casting on 20 stitches, it is repeated back and forth over 25 rows before binding off and finishing the coaster. To download and print this pattern, click on the image below to open in Adobe. 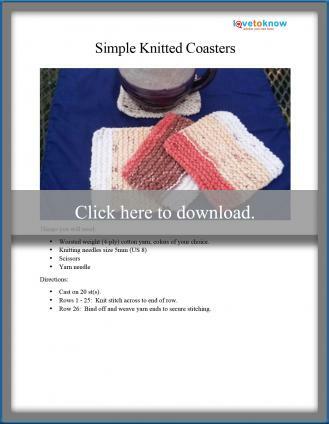 Click to download the coasters pattern. Yarn and scissors are obvious as being needed to complete this pattern. There are a couple of things to consider when choosing your knitting needles and the yarn needle. The yarn needle is used to weave the ends of the yarn into the stitches to secure them when your coaster is finished. Use them the same as a sewing needle. Thread the yarn end through the eye of the needle and weave through the center of the knitted stitches. This will secure the yarn and keep it from coming undone. You never want to cut the yarn at the beginning and ending knot. That is a recipe for disaster. If you have a metal yarn needle, by all means use it. If you do not, plastic yarn needles are easy to find and very inexpensive. Most craft stores or department stores with craft sections carry packages of plastic yarn needles for less than $3. There are several types of knitting needles on the market - plastic, bamboo, and aluminum. They all cost about the same. Most craft stores sell them for less than $10 a set. For a beginner, it can be overwhelming to figure out which knitting needles to buy. You will need the straight needles for this pattern, not the double ended or the circular knitting needles. As for the material they are made of, that is personal preference. If you have a friend that knits, ask to try her needles before buying your own. While these coasters can be made with any kind of yarn, the best yarn to use for coasters is cotton. Cotton yarn is more absorbent and is machine washable and dryable without color fading or bleeding. It will not shrink at all if washed in cold or warm water. However, hot water will cause it to shrink a bit. Cotton doesn't react when setting hot drinks or bowls of hot food on it, and it will protect your table from the heat. Yarns made of or blended with wool will shrink a good deal when washed in any temperature of water. You can use the other synthetic blends and acrylic yarns, but they are not absorbent and are hard to clean. Once you get the hang of the stitches, the tension in your yarn will even out and your knitting speed will increase. This is a quick knitting project to give as gifts or just to have extra coasters for unexpected guests. Display your coasters where all can see and try out the fun colors and seasonal stripes. Everyone gets coasters for Christmas!